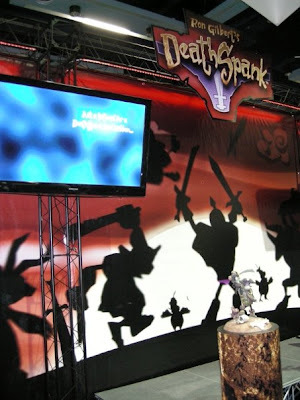 My pre-weekend was spent knee deep in DeathSpank, Ron Gilbert’s newest RPG adventure available on XBLA. I started playing the game last Thursday evening, stopped to sleep for approximately 7 hours, delved back in Friday morning and reached 100% by 3:30pm. Needless to say, this hilarious little game is addictive. 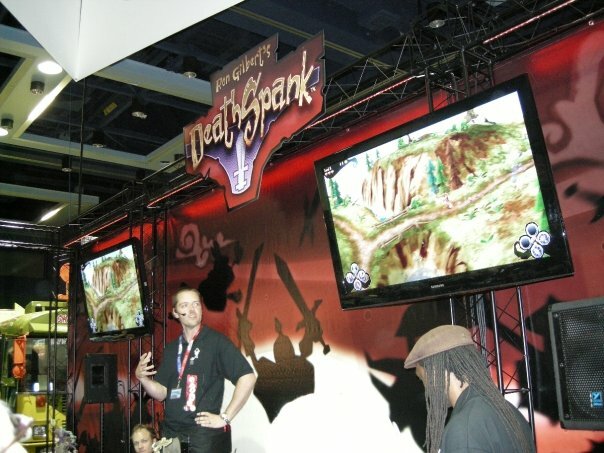 I first saw DS at PAXPrime09 at a booth in the Expo Hall. I remember conversing with the representative about when/where the game would be available and he remained vague and mysterious on the details. I ended up keeping the ‘business card’ promo for the game in my wallet so I wouldn't forget about it. The main character, DeathSpank, is a hero, or as he calls himself, a “Vanquisher of Evil”. And as a hero he declares it his duty to do heroic acts including saving a bunch of kidnapped orphans from getting into the hands of Lord Prong, the villain and keeper of the ‘Artifact’-a purple thong. Between rainbow, um, waste left behind by unicorns and outhouse transport devices, DS is one of the most absurd and adorable games I have played in awhile. One of the highlights is the dialogue, as most of the conversations between our hero and the NPCs are quite witty and tongue in cheek. I would like to call it smart, but it’s really kind of eye-rolling with one-liners. Not in a bad way, however, it is definitely part of its charm. The overworld map is completely interconnected (no lengthy area to area load times) and absolutely gorgeous-the colors and animation are incredibly well designed for an arcade game. The bulk of the gameplay is side quests-I would say about 65% of the game lies off the main path. I imagine if you ignored all of the NPC requests to collect guts, wood, or Keep on Truckin’ posters you could finish the game quickly, but the majority of the fun lies in the side quests. If you are looking for a highly entertaining experience with the same kind of cutesy humor last seen in Castle Crashers, DeathSpank is worth the $15 price tag. 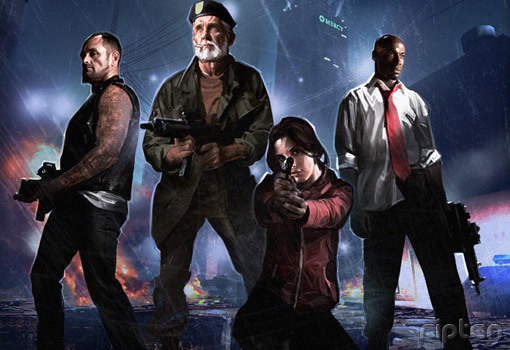 I have been desperately trying to love the Left 4 Dead campaigns Matt has been helping me with in the past couple of weeks, but I am mostly finding it to be an anxious experience. I appreciate that there is a separate musical score for the hierarchy of zombies, but it really only helps me so much when I'm suddenly snatched from behind by a giant tongue and dragged into the woods. Then my heart starts racing and I feel guilty about making one of my teammates save me from the Smoker….again. God only knows how horrible I would feel if I were playing with strangers online-especially those who have been replaying the same five campaigns for going on two years now. I find that an Assault Rifle is my best friend through this journey because it allows me to panic and shoot in random directions with a fairly high success rate. I got caught in some sort of menu bug during the first campaign and had to run towards the helicopter while only able to see half the screen, which was a little more intense than I normally like my gaming, but we did make it-even if we abandoned two of our gang to the hungry zombies. Hey, they should’ve hustled-we couldn’t wait forever. What? You say we should’ve gone back for them? Um, did I mention there were zombies? Yeah, everyone for themselves. Two big PAXPrime announcements were made last weekend as well. The first declaring that the 3-Day Passes had officially sold out 50 days prior to the event. I have to admit that I got really excited about this one. Not only does this mean that we are getting closer to P-Day, but also that this giant community of gamers has spoken again and boy is our voice loud. I love skimming through the Official Forums and seeing all of the threads that involve the internal network of PAX communities-the Cookie Brigade, the cross-country travel groups, the Pin Traders, the Assassins…the list could go on and on. PAX brings so many people together in a such a positive way-I get a little emotional when I really consider all of the elements of the convention that make it so great. The second announcement was that they have expanded (again) and this time the Main Theatre will be several blocks away inside Beneroya Hall. I have mixed feelings about this change. On one hand, I really love the idea of using such a beautiful space for our convention and being able to sit down for the concerts due to the arrangement within the hall (hey, I’m old-my days of gripping the front of the stage in wonder are over). But I also like to come and go as I please, and having a satellite site for some of the lectures and panels sounds fairly inconvenient for a casual audience member. I am optimistic that it will work well, however (nothing could possibly be worse than the Main Theater/Queue Room arrangement during PAXEast), especially since this change allows even more attendees to experience the PAX phenomena.